A list of things to do in Langebaan. Water sports, such as fishing, SUP, sailing, hobie, kite surfing, windsurfing, mountain biking, paddling, kayaking, quad bikes, walking, swimming, surf skiing, water skiing, wake boarding. 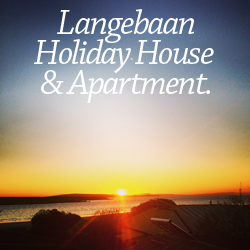 If you are using a mobile device, any smart phone such as, iphone, blackberry, android, galaxy or an ipad, click on the little arrow in the top right hand corner for a list of things to do in langebaan. Located on the Cape West Coast and once a whaling station, Langebaan has evolved and firmly established itself as a tourist attraction to be reckoned with. While the town was officially founded in the early 1900’s, its history dates back hundreds years as an area once inhabited by the Khoi San people long before even the earliest Dutch and English explorers passed through. Located as it is on the shores of a tranquil lagoon the town of course offers a wide variety of water sports and activities, including kayaking, windsurfing, kitesurfing, boat trips and fishing, as well as paddling in the shallows or simply enjoying the white sandy beaches. The lagoon itself forms a part of the West Coast National Park, a wildlife sanctuary and home to many indigenous and migratory bird species as well as small mammals, making it ideal for bird watchers and nature lovers alike. Also for those who wish to view the raw, untamed natural beauty of the Cape West coast region and planning a visit during the spring, it is worth bearing in mind that the area like much of the surrounding countryside is carpeted with wildflowers in the months of July to September. A recent addition to the Langebaan landscape is the Langebaan Country Estate development, both a residential estate, and an old style country club, with a golf course, braai area, pro shop and other facilities, this genteel location will appeal to those who seek an upper class outlet for their energy. Boasting fossil sites, fynbos and wildlife, the Elandsfontein Private Reserve offers as exclusive a getaway with a decidedly wilder theme. View the recently reintroduced antelope, zebra and Cape Buffalo on a game drive, and watch the sunset from the luxurious lodge. A famed local mountain biking company, Live2Ride, who offer mountain bike tours of some of the most beautiful parts of the country, have chosen Langebaan to be a part of their West Coast experience and they are well worth contacting for those energetic enough to explore by pedal power. For a similarly close to nature opportunity to explore, albeit on a very different mode of transportation, Windstone offers horseback tours of the area, as well as various activates for families and children. But Langebaan is not entirely devoted to the outdoors. For culture lovers, the Bay Gallery in Bree street showcases the work of local artists, in various media, including paintings, sculpture and textiles. If you crave the bright lights of the city, this town has something for you too, in the form of the Club Mykonos hotel complex, which boasts several entertainment options, including a casino for those who are feeling lucky. With all of this activity, one is bound to work up an appetite, and Langebaan is glad to oblige. There are several fine restaurants, coffee shops and other eateries in town, but surely the most famous, and unique must be the Strandloper Restaurant. This legendary local restaurant is located on the beach at Langebaan lagoon, and serves exquisitely prepared seafood and other dishes .Patrons can take off their shoes and feel the sand and sea between their toes whilewatching the kids play on the beach. Langabaan Lagoon is probably one of the best places in the world to learn to kitesurf, with plenty of wind and those shallow warm waters at shark bay it is just paradise.